The adults are really going to enjoy this wonderful Peaches and Cream Vodka Pops recipe! These do not take long to make, and they are creamy, delicious "cocktails" on a stick for the grownups to enjoy! If you want to share these with the kids, just omit the vodka. You could also blend the mixture first for the kids (omitting the vodka) pour a couple into the cups, then add vodka to the mixture for the grownups, and blend another time, in the blender. Puree all ingredients in blender. Place Dixie cups in muffin tin. Pour peach mixture into Dixie cups about 2/3 full and freeze for about half an hour, then insert popsicle stick in center. Freeze another 2 to 3 hours. 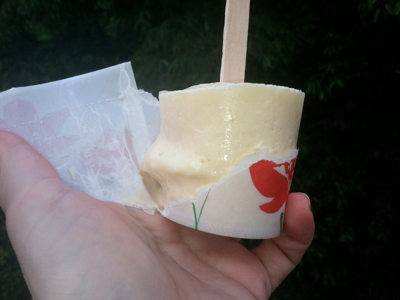 Peel Dixie cup "wrapper" away from popsicle and enjoy!